GM HIKARU NAMAURA WINS AGAIN! 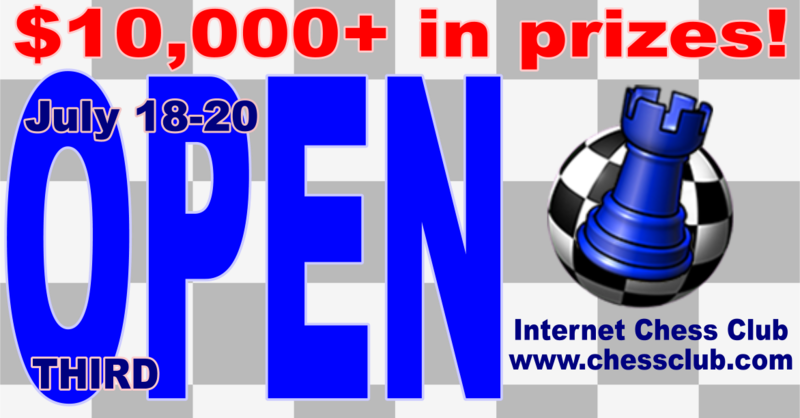 This year the ICC Open has an amazing jackpot: $10,000+ in prizes! Prizes in cash for all the 8 finalists, and impressive prizes in ICC FREE membership for the class winners! The first two editions were won by GM Hikaru Nakamura. In the second edition Nakamura won a spectacular final against the young Armenian GM Simonian Hrair. The ICC Open is an occasion to measure your strength against super-strong players and, why not, to win one of the great prizes. The qualifiers will be again held at 2 pm EDT and 7pm EDT on Friday and Saturday, to give every ICC member from all over the world a chance to participate in this awesome event. The only and one BIG online Blitz tournament open to all. Don't miss the fun! ICC is expecting strong GMs to participate this year, and it will be a THRILL! TIME CONTROL is 3 + 0 (3 minutes with no increment). There will be four qualifiers. You can play in as many qualifiers as you like. All qualifiers will have 11 rounds, swiss pairings. The games are rated in the Blitz category. Latejoining is possible until round 8, but half point byes are only available for the first five rounds. All times are server time (EDT, New York Time, UTC/GMT -4 hours). Type "date" on ICC and compare to your local time. The top two players from each of the four qualifiers will advance to the knockout finals. In case of a tie, the usual tiebreaks of Tomato tournaments will apply. They are described in detail in "tell tomato help tie" (when connected to our server). Players can take part in all qualifiers if they want to. In case a player who is already qualified reaches the top two in another qualifier, his/her seat will be awarded to the next best player. Finalists will be sorted by the ICC Blitz rating they had when they played their qualifier. The grid will display the following pairings (top to bottom) and qualifiers who go through to the next round will be paired accordingly: 1-8, 4-5, 2-7, 3-6. In the knockout finals, "mini-matches" of four games will be played and, if a tie occurs after that, two more games will be played. If still tied, another two games follow, and in case it goes to 4-4 then the tournament director will determine colors in a single, decisive game to follow by tossing a coin. Should that game be drawn, another game with opposite colors will be played. If drawn again, the procedure will be repeated. In the final of the last two, the match will have six games. Again, if the match is tied 3-3, another two games will be played, and if still tied, yet another two games. Should the final be at 5-5 after ten games, a single decisive game will be played, with colors determined by coin toss. See above for the case that single game is drawn. A match in the finals ends before four (six) games are played, if one player has 2.5 points or more (3.5 or more in the final of the last two). There will be no match to decide third place, both losing semifinalists receiving $600. Same thing for 5th/8th, losing the quartefinals, all four receiving $ 325. You need to have a full ICC membership to take part in this tournament. Free trials cannot play. As the real names of the finalists will be made public, players who own free GM/WGM/IM/WIM accounts on ICC are required to use their public handles in this tournament, as opposed to anonymous accounts. You need to use a recent version of Blitzin, Dasher ICC for Windows or ICC for Mac to play in this tournament. In order to minimize abuse, ICC requires that in order to be eligible for a class, the rating of a player must have been below the class limit not only when the tournament is played but also immediately before this tournament was announced, at the reference date. The reference date is June 1, 2014. Please note that this implies that your account must have existed on the reference date in order to be eligible for any class prizes. 3. You must have played at least 100 rated games in the Blitz category before the start of your qualifier. Best ratings achieved more than 3 years ago are disregarded for this rule. Instead, a best rating from within the last 3 years, as determined by the rating graph, will be used to establish eligibility. On the other hand, all best ratings you have achieved on previous accounts used by you in the past 3 years do count. Example: You are rated 1650, your best rating is 1950, but on another account you have achieved 2050 two years ago. You will not be eligible for the U1800 class (but might still be eligible for the U2000 class). Cash prizes will be paid by check. Other payment methods may be possible, but require the approval of ICC. Use of computer chess engines and databases while playing is strictly prohibited. Assistance from other players is also prohibited. Only regular ICC accounts are allowed in the tournament (no free trials). During the tournament, a recent version of Blitzin, Dasher, ICC for Windows or ICC for Mac must be used. A player must not enter the tournament on more than one handle, or risk being forfeited on both handles. As the real names of the finalists will be made public, players who own free GM/WGM/IM/WIM accounts on ICC are required to use their public handles in this tournament, as opposed to playing with anonymous accounts.